Measures are taken to relocate them to safer or higher areas but they are temporary steps that don’t solve any problem permanently. In India the rhino habitat is limited to parts of Assam and North Bengal, which limit their diversity, movement and safety channels. There are two major threats that the rhino faces in the Indian context – one is poaching and the other is natural calamities. In most of South Asia flooding is a natural phenomenon that occurs almost every year and much of the rhino habitat is inundated in it. Every year hundreds of rhinos lose their life due to flooding and drowning. 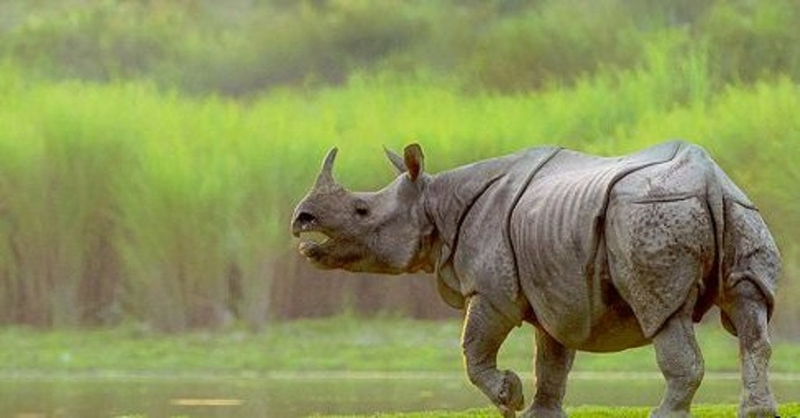 INDIA will collaborate with Bhutan, Nepal, Indonesia and Malaysia to increase the population of three species of Asian rhinos, including the Greater one-horned rhinoceros found in the Indian sub-continent. The five rhino range nations signed a declaration ‘The New Delhi Declaration on Asian Rhinos 2019’ for the conservation and protection of the species at the recently held Second Asian Rhino Range Countries meeting. During the meet, Union Environment Minister Harsh Vardhan affirmed India’s commitment towards rhino conservation. The declaration was signed to conserve and review the population of the Greater one-horned, Javan and Sumatran rhinos every four years to reassess the need for joint actions to secure their future. “The national strategy will pave the path for long-term conservation of the Greater one-horned rhinos in India. I also wish the range country of critically endangered Javan and Sumatra rhinos success in their endeavour to secure the future of the two critically endangered rhinos in Asia,” Vardhan said. The declaration includes undertaking studies on health issues of the rhinos, their potential diseases and taking necessary steps; collaborating and strengthening wildlife forensics for the purpose of investigation and strengthening of trans-boundary collaboration among India, Nepal and Bhutan for the conservation and protection of the Greater one-horned rhino. The meet, organised by the environment, forest and Climate Change Ministry in collaboration with IUCN Asian Rhino Specialist Group, WWF- India and Aaranyak, was attended by NGOs such as US-based International Rhino Foundation and Global Wildlife Conservation; Zoological Society of London Nepal Office and the WWF’s US, India, Indonesia and Nepal chapters. The Wildlife Conservation Nepal, National Trust for Nature Conservation of Nepal, Yayasan Badak of Indonesia and Freeland Foundation of Thailand also participated in the meeting. The fate of the Indian rhino is precariously dangling. There have been talks and piecemeal measures from time to time to conserve the rhino but no concrete, long-term and effective measure has ever come to take shape, which is why the rhino still remains highly endangered in the subcontinent and their deaths continue. There are two major threats that the rhino faces in the Indian context – one is poaching and the other is natural calamities. In most of South Asia, flooding is a natural phenomenon that occurs almost every year and much of the rhino habitat is inundated in it. Every year, hundreds of rhinos lose their life due to flooding and drowning. Measures are taken to relocate them to safer or higher areas but they are temporary steps that don’t solve any problem permanently. In India, the rhino habitat is limited to parts of Assam and North Bengal, which limit their diversity, movement and safety channels. The rhino survives in swampy land and most of India doesn’t offer the exact climatic and ecological conditions that suit the animal. This is why breeding and conserving the species becomes all the more important, limited as it is in its spatial distribution. It does not have the flexibility of survival like the tiger or the elephant, which get a more conducive atmosphere in most of India. Poaching is a serious issue that is yet not stemmed. Every year, poaching takes several of rhino lives and despite all the brouhaha and short-term measures, no permanent solution has yet been found to the menace. Poaching is a very intricate and widespread problem that is not that easy to check either. Poaching gangs have strong cartels with high link-ups and international territories of operation which makes it difficult to track poachers effectively and punish them. Even inside the country, they have a strong access to people with heft and money and this immunes them to stringent action or early arrests. It is a billion dollar trade and is flourishing globally. No country has very effectively been able to tackle poaching— it is a pretty much like terrorism. Added to that the poachers are tactically very astute and they have advanced weapons which many a times ace out our traditional forest guards. Our guards have obsolete weaponry and their tactical skills too are old as they are not regularly trained or updated with modern day skills and strategies. Here is an area where the poachers excel. The forest guards are also much lesser in number than required, which puts immense pressure on them to guard vast areas. Often it becomes impossible for a guard to single-handedly monitor a large swathe under his beat and poachers take easy advantage of these lacunae by sneaky manoeuvres they are so adept in. Unless the forest management is spruced up and its staff match the skills of the poachers or even better them, it will always be a losing chase for them. The Asian rhino is a rare species and their numbers have dwindled to more than 3,500 in the wild by generous estimates. It is good that an inter-Governmental meeting and association have been set up to collectively work towards saving the rhino. Since poaching is an international trade, international co-operation and joint action is very important and this has often not been happening. We will have to see how effective the co-operation eventually turns out to be and how well the countries gel and synchronise their effort. Apart from international union, the countries also need to strengthen their internal mechanisms. India in particular needs a more robust and effective work plan to control forest crimes. There must be more budgetary allocation to the department and strategic and technical upgrading of the working of the forest guards to be in line with the best international practices. The forest department must be better equipped and guided to take on poachers effectively. The police and the legal system also need to support the clean-up by their quick action. Police botch-up and legal tardiness dilute the effectiveness of any punitive action against poachers and this in turn emboldens the wrongdoers. We cannot allow any leeway or leniency in our approach due to systemic or functional lags, and lacunae. Poaching has to be taken seriously because it is the single most detrimental factor not only for the future of the rhinoceros but also for other animals like the elephant or the tiger. If there is a very effective tracking, monitoring and nabbing system in place, backed up by an efficient legal framework, poachers can be tamed and the widespread poaching culture rooted out. Lawmakers too must support the Government initiative above their pecuniary interests and help bring the guilty to book. By the way, our environment is in grave danger and for our own safety, we need to protect the flora and fauna as best as we can, even as much of the damage been already done, we are fast running out of time.